Before the wedding things got crazy! And me being the crazy person that I am decided this would be a great time to move my whole blog over to wordpress to give me a little more freedom to do what I wanted with it. I spent a ton of time doing design tweaks and getting everything looking great (and working better) so I could get back to focusing on the important stuff. More awesome content for you guys! I still have a lot of work to do on it, but I plan to be up and running (and posting again) in a week or two. 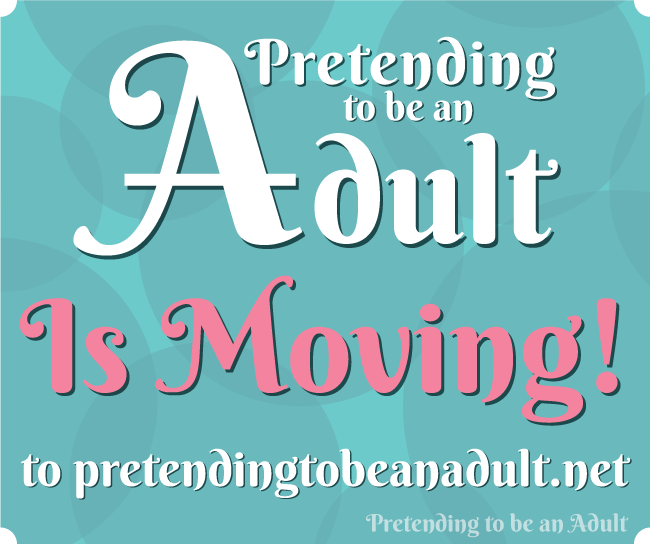 So head over to pretendingtobeanadult.net to see the new space and make sure to sign up for my email list so you don't miss any posts in the transition over! Where was I? Oh yeah budget! So here is my starter guide to creating a budget and sticking to it! 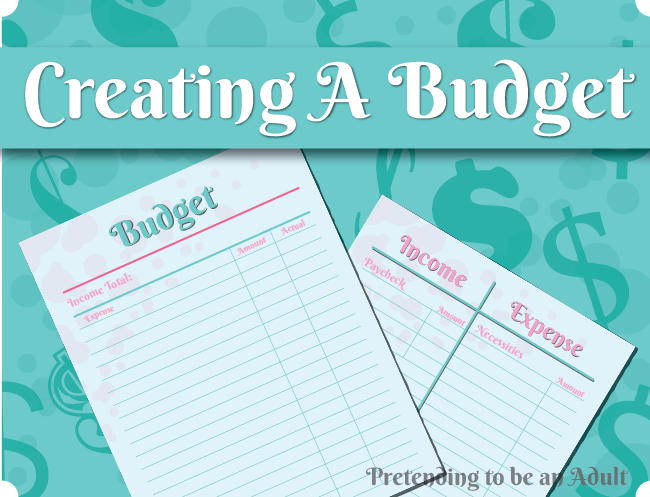 Figure out how you want to create your budget. I use a combination of things. Usually a paper worksheet or spreadsheet to plan, then a budget tracker like Mint to keep up on how I am doing and how much I actually spend each month. Oh and just to make the not so thrilling topic of budgeting SO much more exciting I created a super cute worksheet you can use! (you can get a sneak peak in the image at the top of this post) It goes hand in hand with my steps in this post. 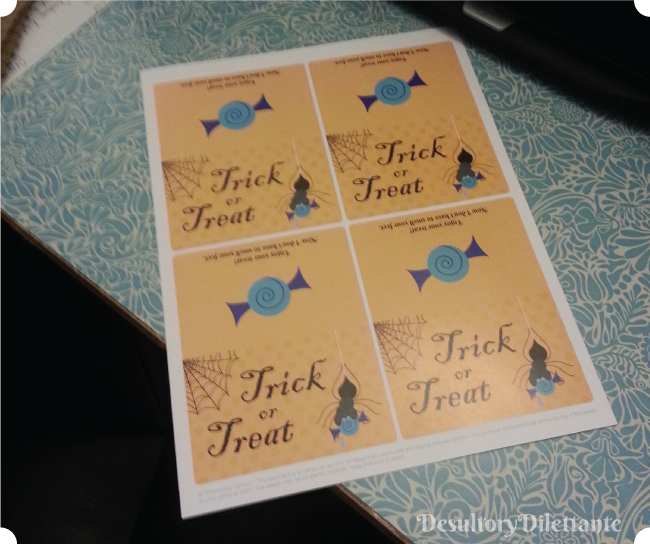 Click the button below to get it! Make a list of all the income you have in a typical month. The easiest way to do this is by looking at how much you made last month and using that number. If you have a steady job where you make about the same every month this part is super easy! If you have an inconsistent income go with the lowest income month out of the past few months. That way you know you typically make at least that much and can budget around that number. This is all the stuff you don't have much of a choice in paying for. Stuff like Rent, Utilities, Phone, Garbage, Water, Laundry, ect... When I do this I make a list in order of the bills that would have the biggest impact if I didn't pay them. For Example: If I don't pay my rent I will be homeless. If I don't pay my electricity I will freeze to death in the winter. If I don't spend $100 in clothes this month I won't look new and fresh. You can look at what you spent in previous months and take the average to use as how much you should budget for that category. Your budget will be more accurate and you may find fluctuating patterns that can help you save money once you know to watch out for them! This list is just all the stuff you would like to include in your budget if the money allows. Everything that didn't make it on the Necessary list. No you do not NEED a $100 monthly shoe budget... but if new shoes are super important to you add it to this list and see if you can make it fit in the budget later on. List these in order or what you want the most. It is best to use your numbers over the past few months to see what you typically spend in each of these categories. Take your total number from your income list and put it at the top. Now going one by one down your Necessary Expense list subtract each expense from your income number. If you get through your entire Necessary list and you have money to spare CONGRATS! You are living a life you can afford! skip to step 7! If your starting income number runs out before you make it to the end of your necessary expense list continue to Step 6. Okay time to put your big girl pants on and take a deeper look at these lists to find your issue. When it comes down to it, you are either not making enough money, Spending too much money, or Both. Luckily these are all solvable problems! You can get a better job or an additional job. To make ends meat this might mean taking on a job you don't want, but unless you can make cuts in your spending you might not have a choice. It doesn't have to be a forever job, just one that will pay the bills until your situation changes. It is very simple you need to be spending less money. You need to make some cuts. This might mean downgrading your phone plan to bare bones, moving into a smaller apartment, trading your car in for one you won't have a payment on, or lots of other options. Now if you didn't listen to me and you put some non-necessities on your Necessary list you could just cut them and you might be done! So go make some cuts! Stop spending so much money! Eating out is not a necessity. Take that money you were going to spend on dinner out and buy some groceries and MAKE YOUR OWN DINNER. Cooking is not hard and anyone can do it. I don't want your excuses. I don't even care if you are boiling pasta and heating up canned sauce to put on top. If it tastes bad then that is just all the more incentive for you to learn how to cook! You might even find out you like it! GASP! If you have made it all the way to step 7 you are paying everything you need to pay. Hopefully you even have some left over. Now before you go out and spend all that extra money you have because you budgeted, you need to take care of a few things. Go back and make more cuts to that budget, yes I know there are some things in there you feel like you need, but you need to start with bare bones before you can start adding "Luxuries" like new (insert items you think you need) the one you have works fine so stop complaining. NEXT you need to put some money into savings. Before you make that budget for your obscure kitchen gadgets collection, take a nice heaping amount and put it into a savings account. You should have an emergency fund of at least $1000 to start off with. After that you can start throwing money into savings for big purchases or maybe a vacation? This cycle of saving up before you spend is what keeps you out of debit so it is a good habit to start on now. If you are too stingy with your money and not already in good spending habits you are at high risk for a spending binge! You need make a few small purchases like coffee with the girls or that dress you have been eyeballing, so you don't just give up and go back to an unbudgeted life. GASP! WARNING! This is NOT an excuse to impulse buy things. Give yourself a certain budget for these items. (I call it fun money in my budget) You can also use it in combination with your non emergency savings to finally buy that new TV you have been saving for months and months to get! This time you actually deserve it and it will be a completely guilt free purchase! If you still have something left after all this you can start making your budgets for the non necessities. (or pay off debt!!! I know I am no fun...) Just make sure that before you start spending money according to this new awesome plan you have made, that you know exactly where every penny is going! Every bit of extra cash you may have not accounted for should go someplace in your budget. So if you find some extra cash you missed go back and update the budget, because if you leave it up for grabs it will end up lost. This is not a do it once and done type of thing. This is something you have to keep tabs on and revisit at least once a month to see how things are going. It took me 4 months of tweaking twice a month to get a realistic budget for myself the first time I did it. I had no clue how much I was typically spending on food! I spent all of what I thought I would need in groceries for the month in the first week of my first budget. So keep at it, it gets easier the longer you do it. Still need some help? Don't worry I got you! 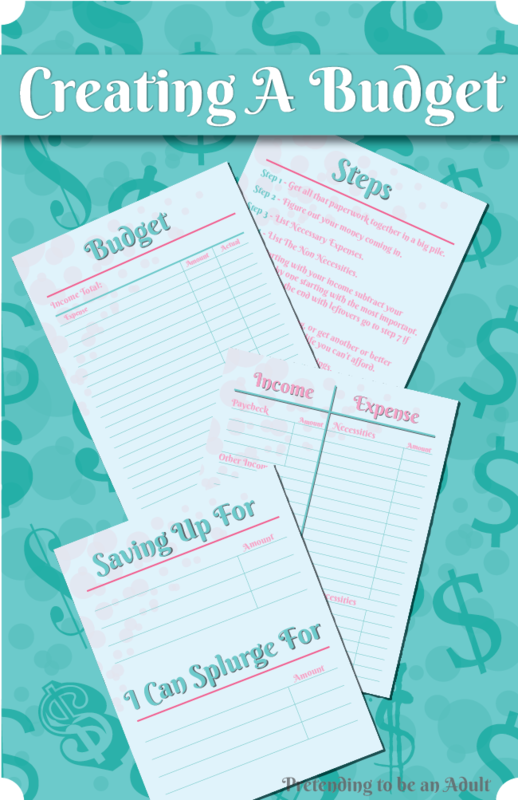 Click the button below for the 6 page interactive budget worksheet I made just for you! 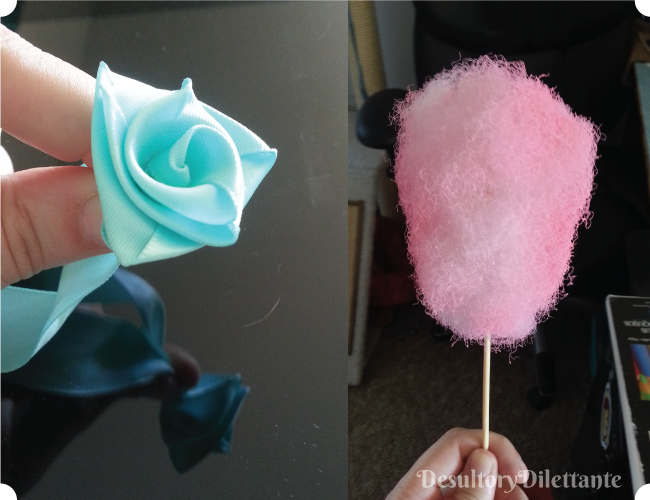 (It is the cute one at the top of this post +4 more pages!) It goes right a long with the steps I have laid out in this post. AND it does all the math for you! (I tried to take out as many icky parts as possible!) You're Welcome! So tell me what it your biggest budgeting tip? What are you saving up or splurging for? Pretending To Be An Adult! 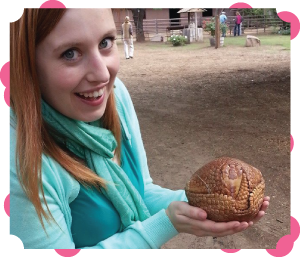 You may have noticed a few changes around here... For example the NAME OF THE BLOG! Sound good? Great! I will be kicking things off next Thursday with "How To Create A Budget"
Because if you have you finances down and you can pay your bills on time you are basically an adult... well almost. 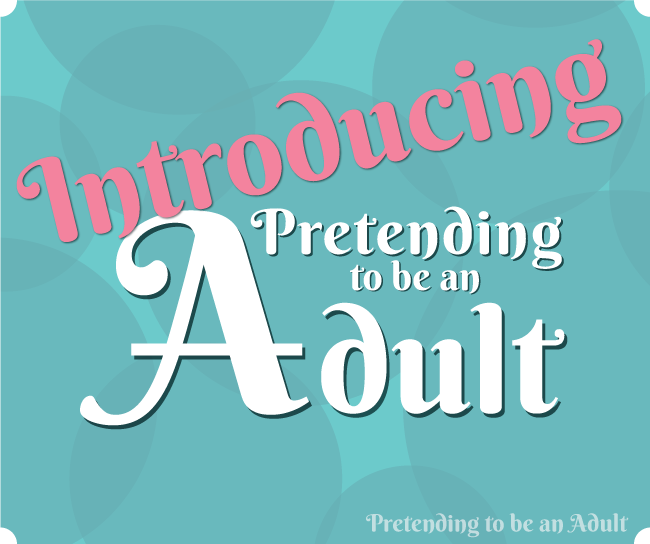 pretend to be an adult? Let me know in the comments and I just might do a post about it! You might never know if you don't ask! Oh My Goodness! I am a crazy person! So 6 months ago I took a job with a crazy commute that left me with enough time at home to eat and go to bed. So I had to put all of this on the back burner. That was a big mistake, I am not happy and I don't have enough time to sleep a full 8 hours let alone plan my wedding or keep my etsy shop going! I have done a lot of thinking and this blog and my shop are so much fun for me I have to get them up and running again so I am going to MAKE SOME TIME! To start off I am launching a whole new series of items in my shop for bloggers and taking on freelance work! YAY! If your blog needs a new logo or some custom graphics I am here and ready to help! 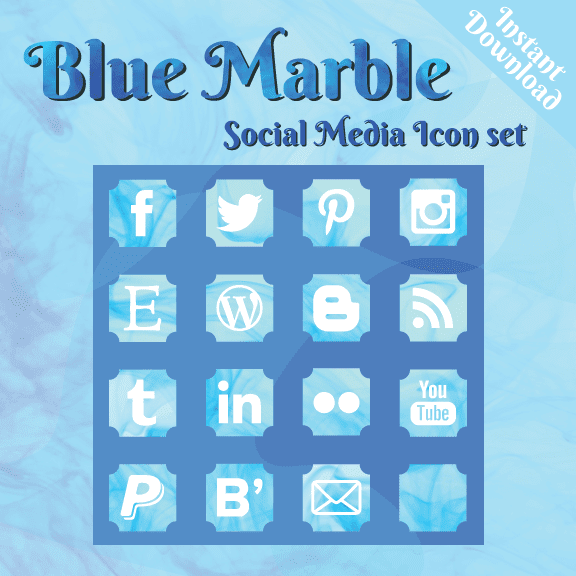 As my first order of business I offer to you the Blue Marble Social Media Icon Set for bloggers now available in my Etsy Shop! That is all for this week! See you again soon for more exciting things! I am sorry for the lack of posts recently, but life continues to be crazy. Wedding planning had been put on the back burner for the past few months and because of that I haven't had much to write about here. 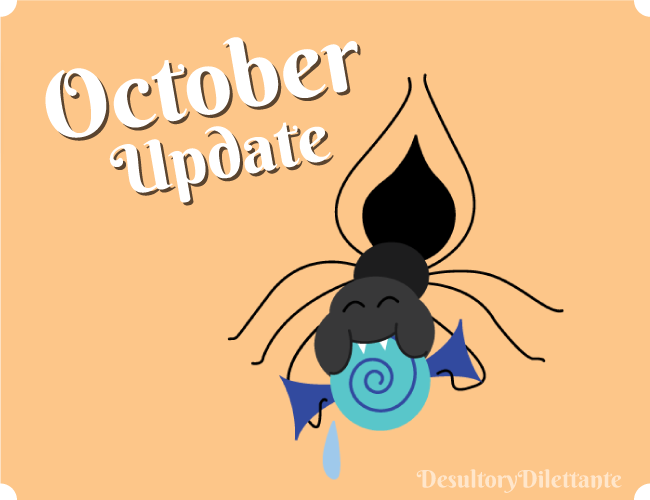 I am happy to say October is going to be very different. I totally redid my Wedding Schedule and started doing crazy catch up work. I officially have one year as of this month before I get married so time is tickin' to get everything done, and boy do I have a lot to do! In the next few months I will be getting a lot of my decor tested out and made so that means I will have a bunch of DIY tutorials here on the blog. That is all the updates for now, see you next week!